This solution enables secure commercial use of the automatic translation engine, “Everyone’s automatic translation @ TexTra®,” developed by the National Institute of Information and Communications Technology (NICT) using Memsource, which is a cloud-based translation support tool. By using Memsource, you can not only manage translation projects efficiently, but also post-edit translations using NICT’s excellent machine translation engine and store that information as a TM (Translation memory). You will soon be able to adapt machine translation engines exclusively to your field(s) of business or your company (scheduled for September 2018). “Everyone’s automatic translation @ TexTra®” is a machine translation engine developed by the National Institute of Information and Communications Technology (NICT). Using NICT’s high-performance machine translation engine, we are able to achieve high-performance machine translation output focusing on 4 languages: Japanese, English, Chinese (Simplified and Traditional), and Korean. Up to now, using “Everyone’s automatic translation @ TexTra®” for commercial purposes required users to conclude a licensing agreement with NICT separately. 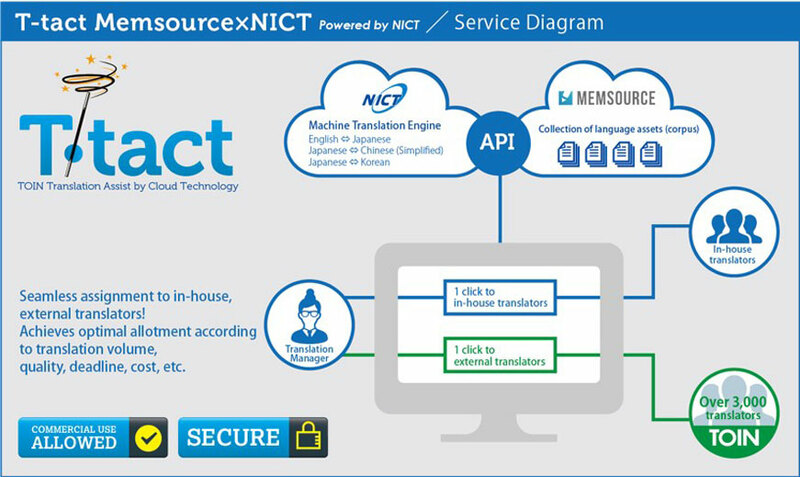 However, “T-tact Memsource × NICT” enables NICT’s high-performance machine translation engine to be used for business with just a simple procedure, and without requiring users to sign a contract directly with NICT. T-tact Memsource uses the cloud-based translation platform, Memsource, as a front end. Memsource is intuitive, easy to understand, and makes it easy for users to take advantage of various features such as translation asset re-use. 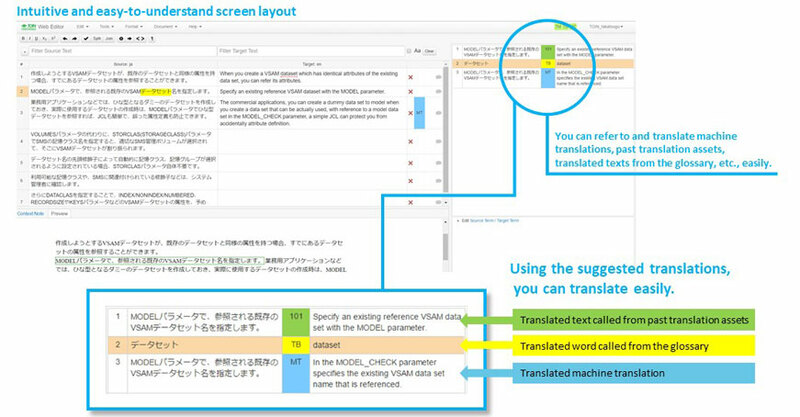 We recommend this solution for those who want to edit and use translation assets with machine translation. We are preparing an interface that can be operated intuitively even for those who operate for the first time. Furthermore, the user can acquire a translated file simply by dragging various files. In projects involving multiple people, such as project managers, translators, proofreaders (checkers), etc., it is necessary to manage who will handle each task and how far work has progressed at any given moment. By setting up a workflow, you can proceed by allocating human resources among the various steps in the translation process, such as translation, checking, native check, etc. A change history is recorded automatically for the changes made in the previous step. A workflow consists of individual steps, such as translation, proofreading, etc. ※ The “Workflow” function can be used with Memsource “Team” contracts and above. It is suitable for those who want to know the outline of what you do not ask for an accurate translation quickly. There are two types of users in Memsource, PM (Project Managers) and persons in charge (Linguists). Project Managers create translation projects, upload manuscripts to the cloud, assign translation work to persons in charge (Linguists), and request translation work. When a person in charge (Linguist) finishes a translation, the Project Manager receives a ‘translation completed’ email notification. Linguists can accept translations requested by a Project Manager in the cloud and translate them in the Memsource Desktop Editor (or web editor) to complete translations. When a translation is completed, a ‘translation completed’ email notification is automatically sent to the Project Manager. If you also want a high-quality translation by a professional translator, you can order a professional translation from TOIN using the Memsource screen in the same way it is assigned to an in-house translator. You can request a TOIN translator as if he/she is one of your in-house translators, so it is not necessary to go through cumbersome preparations to request work from an outside vendor. By using the analysis function, you can immediately confirm the amount that will be charged. The content translated by the translator is also stored as a translation asset that can be re-used for the next translation, so it is possible to reduce costs and maintain consistency of quality, as well as shorten translation time. Can interoperate with Google Drive, Dropbox, OneDrive, etc. Can interoperate with FTP, WordPress, Drupal, etc. Can interoperate with Git, GitHub, GitLab, etc. Can interoperate with various CMS: Hubspot, Marketo, AEM, Zendesk, Typo 3, etc. The machine translation server is operated by Amazon AWS. We will give you a separate estimate if you wish to operate it with your own AWS instance or on-premises. You can also have the machine translation engine learn from your customer-specific translation pairs (generally called a “corpus”) (for a fee), please consult with us separately. We offer a trial period of 30 days before you officially apply, so you can apply after confirming actual usability (please inform us at, t-tact_support@to-in.co.jp, if you would like a trial).